Since 2004, Steel in the Air has served over 3,000 clients, reviewed over 10,000 cellular leases and tracked over 2,000 lease buyout offers. We represent private landowners, corporate property owners and public entities in lease negotiations against wireless carriers and tower companies. We also consult on cell site and cell tower valuation and brokerage. Our cell tower and cell site database has grown to encompass over 285,000 cell site locations nationwide. If you have followed our musings over the years, you know that we don’t like the lease renegotiation industry. In the past we have observed some companies (not Lendlease, Tower Alliance, or Softbank/Sprint) use high-pressure tactics, sometimes outright misrepresentations, and downright aggressive salespeople to convince landowners to agree to terms that are not advantageous to the landowner. These tactics can tarnish the landowner/carrier relationship in our opinion. Some renegotiation is necessary, especially on overly high leases; however, the lease renegotiation industry often targets all leases, not just those that should be reduced – all in the vein of needing to reduce costs and to generate a fee for the lease optimization company. Again, we don’t object to the renegotiation efforts themselves, but we do strongly believe that the tactics used can be shady and manipulative. Recently, we have become aware of some letters and requests that Lendlease (or their agents, Tower Alliance) are using with building owners with Sprint leases that we believe are not advantageous for the landowner/building owner. 1. They know how long Sprint is likely to continue using those leases or have negotiated a guaranteed term. 2. They intend to try to “remarket” the Sprint lease space to other carriers if and when Sprint terminates. 3. Lendlease sees the potential to renegotiate with building owners to expand the Sprint lease area and, even if Sprint doesn’t terminate, still lease space to other carriers. It was a pleasure speaking with you this morning. The intent of my telephone call and this follow up email is to inform you of the project currently underway in the US by the Sprint/Lendlease Joint Venture as described in the press release and Letters of Authorizations. Sprint is assessing all of its rooftop network real estate in order to assure maximum cost efficiency. It has relocated many sites that are not efficient. The site as referenced above currently remains one of a group of sites identified as a cost efficiency target in the Sprint/Lendlease Joint Venture. In addition, I have attached some press releases speculating on the outcome of the announcement regarding the possible merger of Sprint/T-Mobile for informational purposes only. My goal is to have an amended and restated lease executed once we have negotiated the most favorable terms for the mutual benefit of both Landlord and Tenant. Before we go on to the “ask” from Lendlease and why we recommend that building owners don’t consider it seriously, we have to question the statement, “It (Sprint) has relocated many sites that are not efficient.” Unless they are referring to lease decommissions from the Clearwire/Nextel portfolios, we are unaware of any sites that have been relocated by Sprint due to cost efficiency. Perhaps there are some, but we haven’t seen them. At any rate, we highly doubt many is more than 50. Tower Alliance on behalf of Lendlease then asks for a number of concessions from the building owner on the new lease, which we have listed below along with our thoughts on why such changes are ultimately really bad for the building owner. What happens if the landowner doesn’t agree to these really bad terms? Tower Alliance suggests that “if we aren’t able to come to a new agreement, the tenant will be forced to evaluate alternative site locations.” Note that they don’t say they will terminate the agreement – there has been litigation previously between landowners and another carrier that clearly prevent carriers from saying they will terminate if they don’t get their desired terms. However, the language is carefully worded to imply that termination is a risk. In reality, by not signing, in most cases, the landowner will be in exactly the same position both now and in the future. Sprint is either going to terminate or not. Another replacement carrier will either be interested in your rooftop or not. This deal doesn’t change either of those eventualities for most landowners. There will be a small subset of high-dollar Sprint rooftop leases where Lendlease may end up terminating and moving to a new rooftop. But for most landowners, this proposal from Lendlease is not a good deal and is one we would advise against. If Sprint and T-Mobile don’t merge, there is even less of a reason to agree to these terms. Fundamentally, we don’t like this type of renegotiation effort and will strongly counsel our clients against agreeing to these terms. Got a Sprint lease and feel anguish over what to do? Contact us and we will be happy to discuss your situation and identify whether we can provide any value to you in your decision-making process. One of our clients received a proposal from a tower company that included a revenue share clause. Generally, revenue shares are not proposed by wireless carriers and even less so by tower companies. However, because our client is a governmental entity, I assume the tower company figured it would be better to put a revenue share out for discussion instead of waiting for it to be added. However, this particular revenue share being proposed is a bit odd. For tenants added in the first 5 years of the lease, the landowner will get $150/mo. per tenant. For tenants added after year 5, the rate drops to $75/mo. For tenants other than AT&T, Verizon, Sprint, or T-Mobile, the rate is $50/mo. no matter when they are added. There are a number of issues with this proposed revenue share language. First, we generally advise landowners not to accept fixed-rate revenue shares; instead, they should look for a % of revenue. A revenue share is intended to give the landowner participation in the revenue and often comes with a lower base lease rate to accommodate the future upside. A fixed revenue share though does not tie the landowner’s upside to that of the tower company- instead, it limits it no matter how much the tower company is getting for the lease. Furthermore, the reduction here from $150/mo. to $75/mo. after year 5 is ridiculous and serves no benefit other than to take advantage of lesser informed landowners. Even worse is the $50/mo. for any other tenant – which could include tenants that will pay more than traditional cellular tenants and would exclude future entities that enter the business regardless of how much they pay. From the tower company standpoint, having a fixed rate revenue share is much simpler from an accounting standpoint and much more profitable. This particular proposal won’t be accepted by the landowner- who will and can counter with a % based revenue share given the fact that they own pretty much everything around this location. However, in other situations, the landowner may have to accept these types of terms especially if there are other readily available options. The key of course if trying to figure out whether your property is unique or not. If you need help, please contact the experts at Steel in the Air. For those of you in the industry- have you seen other revenue share proposals that are innovative or outright ridiculous? just happens to match that of Md7's offices. It appears that Md7 and AT&T have decided to remove any indication that Md7 is involved here altogether (except for the address). Is that because the renegotiation efforts have been unsuccessful otherwise or is AT&T just looking to ratchet up the heat on tower owners to remove the opportunity for rent increases due to possible FirstNet modifications? How many times can a company threaten to terminate a lease but not actually terminate it before owners just completely ignore the requests? AT&T knows and based upon the fact that they keep sending the letters, there must be some tower owners that accept the revised terms with each round of letters. 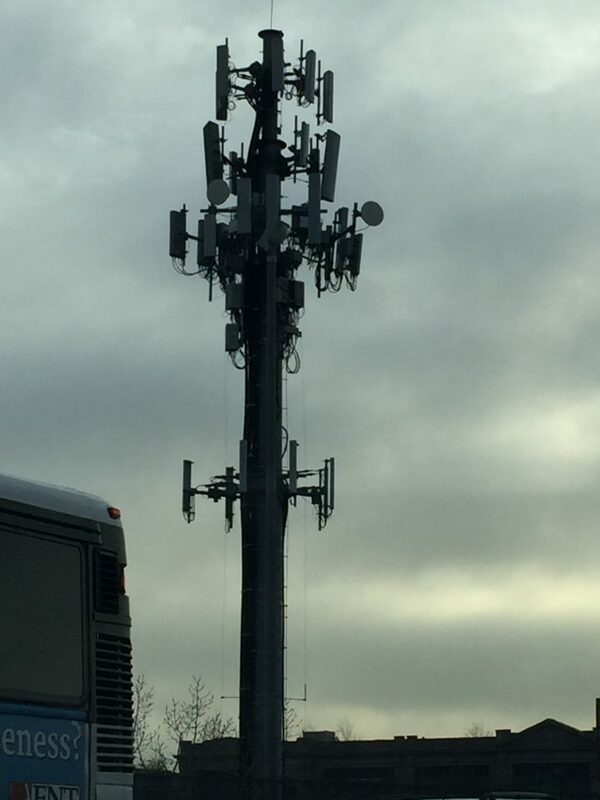 A municipal client, who has multiple public safety towers upon which Verizon is colocated, received a call and letter from a Verizon representative asking for reduced lease rate terms and escalation. The letter is on Verizon letterhead and does not make clear the relationship between Accenture and Verizon but refers to the Accenture employee or contractor as a "Verizon Representative." However, in the email from this representative, the signature block is for Accenture. We surmise this means that Verizon is using Accenture instead of Black Dot or Md7 to renegotiate its leases. This is disappointing because Verizon has historically chosen not to stoop to these types of misleading negotiation tactics. And lest you think it is because of the ever more competitive wireless industry – Verizon still generates a very healthy 45.7% wireless profit margin. No additional rent or fees for any additions or modifications to equipment throughout the contract term as long as the equipment rights identified above are not exceeded. If we can't reach an agreement, we will remove you from our relocation list as we continue to evaluate our real estate portfolio. As always, there is the implicit threat of termination – although carefully couched in language that doesn't constitute an anticipatory breach. So in essence, Verizon wants 30,000 square inches of equipment space in their 10' RAD center along with 16 cables. So no matter how much capacity this reduces on the tower or how much a tower owner would have to pay to structurally upgrade the tower to accommodate it, Verizon expects not to pay any additional fees. Generally, this is ludicrous and no tower owner should ever agree to this loading, regardless of whether they end up negotiating more favorable rent terms, in order to ensure the longevity of the lease. We aren't suggesting that Verizon may not eventually relocate some cell sites, just that it won't be that common and will be reserved for situations where they can save enough money by moving to justify the substantial expense of doing so. In this case, our municipal tower owner will be telling Verizon that they can keep their name on the relocation list. There is no chance on any of them that Verizon will end up moving. If you receive one of these Verizon/Accenture letters or calls threatening to renegotiate your lease or relocate the tower, please contact us. 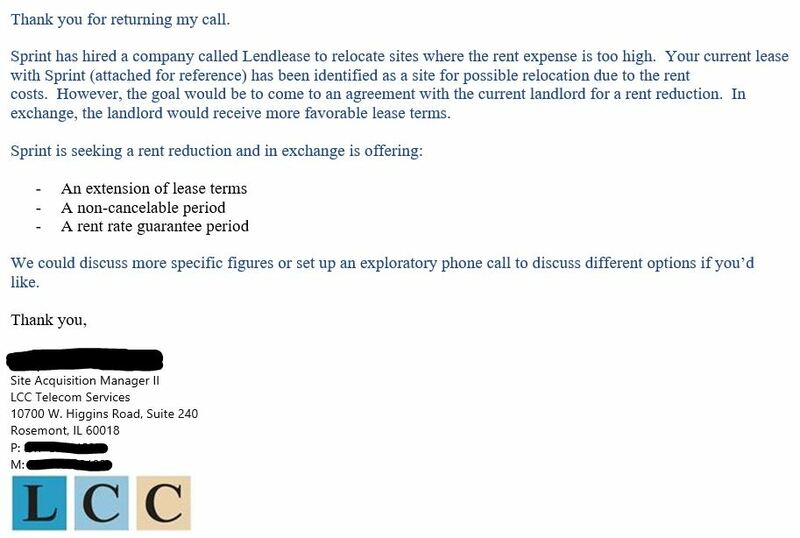 A landowner client of ours received this email from LCC, a company allegedly acting on behalf of Sprint where they claim that if the landowner doesn't agree to concessions, that Lendlease will consider relocating the Sprint site. If you receive a similar request from Sprint, LCC, or Lendlease or another cell tower lease optimization company, please contact us. We can help you evaluate the proposal and determine whether it is probable that Sprint would move in the event you choose not to accept their proposed rent reduction. Will T-Mobile/Sprint’s Merger Plan for 5G Home Broadband Work without Significantly Higher Capex? What Makes Cell Towers Competitive?